00:00 dcook Let's point to All The Vocabularies!!! Each with their own implicit and explicit biases! 00:05 Francesca dcook: I'm good, trying to survive last week of uni them I'm freeeee! 00:08 dcook Interesting... are authorities not a thing in BibFrame? 00:08 wizzyrea github is first that probably explains some things. 01:05 wizzyrea I need a frikkin holiday. 03:40 dcook eythian: Don't suppose you're around? 03:40 dcook Is that bug exactly what I was just thinking about? 03:41 dcook Whether it creates groups or what..
03:41 dcook What would it do in the case of that bug mtj just mentioned? 03:41 dcook Where the query string contains parentheses? 03:42 eythian it's a fair bit more sensitive to malformed queries than zebra, the way I'm using it. 03:42 dcook That's so weird that I would be thinking about this at this time..
03:42 eythian there's a more robust version, but then I lose a lot of necessary features. 03:43 dcook I take it you don't use quotes atm? 03:43 dcook I wonder what Koha is doing in the background here anyway..
03:44 eythian I have a lot of query rewriting going on, I can't remember if I do things with quotes or not. 03:46 dcook Host-item:Criminology and criminal justice : an international journal is saying something about opac suppression..
03:46 rangi you have at least one item suppressed eh? 03:46 mtj i get this error..
03:46 mtj AH01215: [Tue Oct 13 16:33:30 2015] opac-search.pl: WARNING: query problem with ('pb=Bloomsbury,') not Suppress=1 ZOOM error 10014 "CCL parsing error" (addinfo: "Unknown qualifier") from diag-set 'ZOOM' at /home/mason/git/koha/3.20.x/C4/Search.pm line 384. 03:47 dcook mtj: Unknown qualifier, eh? 03:47 eythian dcook: oh, if a search part is marked as a "phrase" I do manually wrap quotes around it, I think that's all I do with them. 03:50 * eythian closes 2**8 tabs. This make things less annoying. 03:51 mtj H01215: [Tue Oct 13 16:48:50 2015] opac-search.pl: WARNING: query problem with (se,phr="Harry Potter ) not Suppress=1 ZOOM error 10014 "CCL parsing error" (addinfo: "')' expected") from diag-set 'ZOOM' at /home/mason/git/koha/3.20.x/C4/Search.pm line 384. 03:52 dcook That looks like a missing double quote? 03:52 eythian I guess the problem generally is it's easy to have a simple parser that can accept anything but isn't flexible, or a complex one that can be made to do anything, but isn't very relaxed about what it accepts. 03:53 eythian Finding one with both syntax and relaxed-ness is a hard problem. 03:54 dcook mtj: What's your query? 03:56 eythian dcook: sure, but if it sees "se:(one two", is that broken syntax, or a literal string? 03:56 mtj opac-search.pl?q=se,phr:"Harry Potter ;"
03:56 dcook eythian: Ahhh I gotcha. Yeah. 03:57 mtj opac-search.pl?q=se,phr:"Harry Potter "
03:57 dcook Ah stale logs me thinks..
03:57 wizzyrea mtj are you possibly not using xslt? 03:58 dcook mtj: You might need to poke through Search.pm. I think that's where I might be headed next..
03:58 wizzyrea iirc the fix wasn't super complicated. 04:01 wahanui it has been said that search.pm is full of bees. 04:03 wizzyrea mtj intranet or opac? 04:07 dcook Yeah, Zebra does interesting things with ";"
04:08 dcook mtj: ICU or CHR? 04:09 dcook Hmm probably not related after all..
04:29 dcook ZOOM::Query::CCL2RPN might do something..
04:31 dcook Fix yaz-client: semicolon terminates arguments YAZ-851. 04:35 dcook Because Zebra is being hit with this: @or @or @or @or @attr 1=36 @attr 4=1 @attr 6=3 @attr 9=32 @attr 2=102 "test : test" @attr 1=4 @attr 4=1 @attr 6=3 @attr 9=28 @attr 2=102 "test : test" @attr 1=36 @attr 4=1 @attr 9=26 @attr 2=102 "test : test" @attr 4=6 @attr 5=1 @attr 9=14 @attr 2=102 "test? : test? " @attr 4=6 @attr 9=14 @attr 2=102 "test : test"
04:43 dcook Oh... but you can see it in the zebra logs..
04:44 dcook That's cool... * and ? really are both truncation characters after all..
05:01 dcook eythian: Are you still around? 05:27 dcook Well that's confusing. 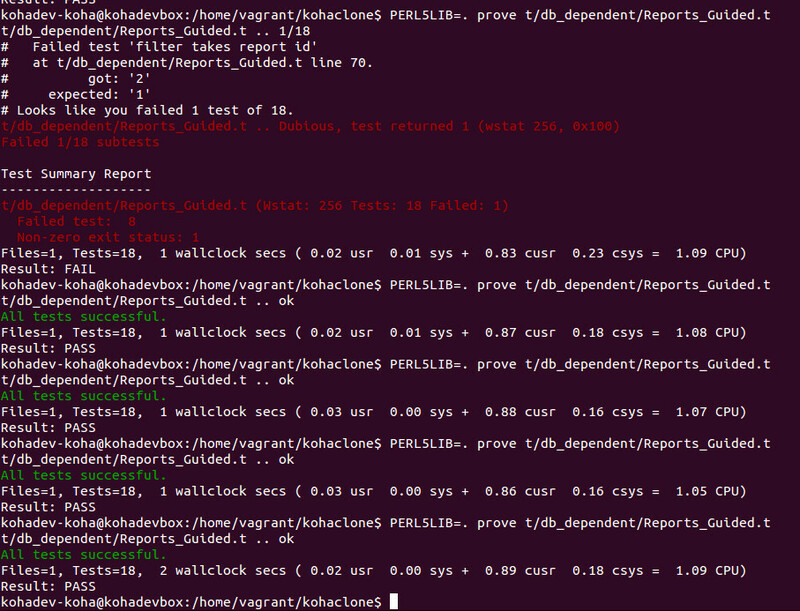 The semicolon thing appears to only be in yaz-client..
05:27 dcook Koha seems to handle it fine? 05:31 dcook Does zebrasrv log anywhere? 05:42 dcook H01215: [Tue Oct 13 16:48:50 2015] opac-search.pl: WARNING: query problem with (se,phr="Harry Potter ) not Suppress=1 ZOOM error 10014 "CCL parsing error" (addinfo: "')' expected") from diag-set 'ZOOM' at /home/mason/git/koha/3.20.x/C4/Search.pm line 384. 05:45 dcook Host-item:"Criminology and criminal justice an international journal"
05:45 dcook But as a unit I guess..
06:56 magnuse Viktor: is there a list somewhere of all the libraries in sweden that use koha? 06:58 Viktor magnuse Not really. Think it's been discussed briefly somewhere. But since there's (not yet) any user group it's sort of what I come across while being "the guy who works with Koha"
07:01 Viktor magnuse Not yet. But I'll try and give it a quick compile. 07:42 * mveron did a search for 'Remove C4::Dates': 31 Bugs, 15 need Sign-off, 6 Signed-off, 1 Fail, 9 Pushed. 4 files left on Bug 14870. And Bug 12072 is ready for testing, but needs all C4::Dates removals. 09:19 ashimema huggin just gave me some laters dating back weeks..
09:21 huginn ashimema: The operation succeeded. 09:26 cait and reminder - dev meeting tomorrow! 09:31 cait or do you want to do it in parallel? 09:32 ashimema always throwing spanners cait. 11:46 ashimema now you missed him? 11:47 ashimema that's what I do best..
12:08 wahanui magnuse is a Norwegian giant. 12:08 druthb be nice to cait, Or Else. 12:17 jcamins francharb: hey, do I recall that you moved to Montreal? 12:17 cait like... what if i want to add a debarment for a group of borrowers... hm. 12:18 francharb Hi jcamins! Yes I did! 2 years ago. 12:19 jcamins Yes I do. 12:19 jcamins You should've let us know... you could've come to the milonga we went to on Saturday! 12:19 jcamins It was excellent. 12:20 jcamins We're thinking of a vacation in Montreal at the end of November. 12:27 magnuse jcamins: noooo, come to norway! 12:33 jcamins magnuse: flights to Montreal are a whole lot cheaper. 12:36 jcamins magnuse: that too. 13:48 Kchris I just tested a bug on the sandboxes (#2). I got an email that the sandbox was not ready, but it appears to me that the patch WAS applied. Does this make any sense? 13:50 * andreashm is back again. keep getting logged out today it seems. 13:57 wahanui somebody said mtompset was catching up in the non-coding aspects of his ministry. 13:57 mtompset Dev meeting in 3 minutes, right? 13:58 andreashm oh, dev meeting now? nice timing from me - I had forgotten. 13:59 mtompset I think so. 13:59 mtompset mtompset is catching up on his other coding projects. 14:00 wahanui tomorrow is a mystical land where 99% of all human productivity, motivation and achievement is stored. 14:01 mtompset I just rechecked... You're right. 14:04 huginn mtompset: Karma for "druthb" has been increased 8 times and decreased 0 times for a total karma of 8. 14:05 cait all i can think of is sip2 right now hm. 14:05 cait i think ils-di doesn't include that... did you check? 14:07 druthb not bad karma for someone who hasn't contributed a patch in gosh-knows-when. 14:07 huginn andreashm: Karma for "andreashm" has been increased 7 times and decreased 0 times for a total karma of 7. 14:10 andreashm We will want to use our current payment system (DIBS). We can fix the calls made to Koha, we just need the functionality set-up (either improve SIP2 or use something else). 14:16 huginn mtompset: Karma for "mtompset" has been increased 28 times and decreased 0 times for a total karma of 28. 14:17 huginn mtompset: Karma for "cait" has been increased 263 times and decreased 0 times for a total karma of 263. 14:36 cait andreashm: hm in what context? 14:37 andreashm cait: We would want to change that to show our users when paying fines through our website. 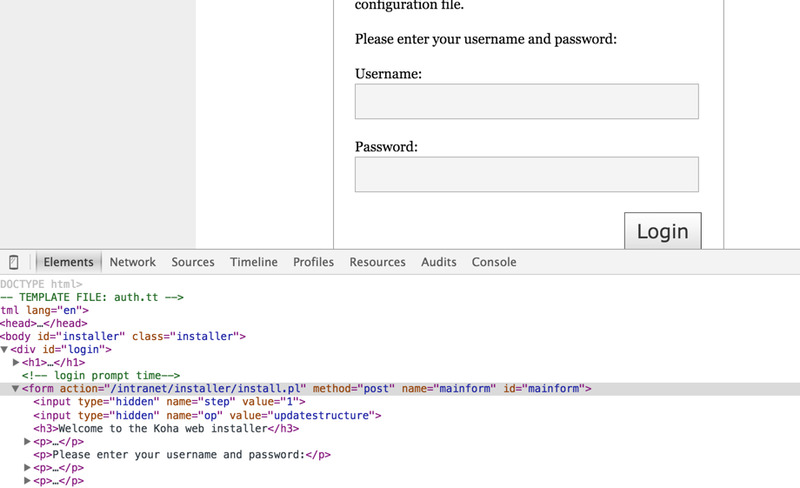 14:42 andreashm I guess we will need to change that in our web implementation then. 14:51 drojf the issue_id in the issues table is auto incremented. the issue_id in old_issues is not. why? 14:51 tcohen cait, do u have the rights to add rel_3_22_candidate to bz's list of keywords? 14:52 drojf ah, i see. so it's not really possible to import circulation history from an old system? 14:53 tcohen cait: who can? 15:01 drojf huh? that sounds weird? what context? 15:03 cait and why is the column with the number of ordered items named Pending order? 15:41 mtompset tcohen: Nice support company page. It's a very clean look. 15:57 nitz0 Hi people, I am testing to send an email to notice overdue. I read that if I run koha_common from crontab daily directory is enough but nothing happens. How can I test mail from koha? 16:00 cait did you configure the overdue notices? 16:10 nitz0 cait: Yes I think I did everything right. 16:11 nitz0 It's not possible to force the email? 16:20 nitz0 If I send the first notice the script will not send an email again? 16:22 nitz0 Or where I can find the generated overdue notice...? 18:28 mtompset Corporate policy. Sorry. 18:30 pianohacker @later tell ashimema I'm catching up too, what was that in reference to? And would you like a signoff on that? 18:30 huginn pianohacker: The operation succeeded. 19:14 magnuse confuse all the things! 19:21 pianohacker rangi: back from vacation? 19:36 jcamins It would be pretty cool if they integrated Tumer's Zebra changes to 3.x. 19:37 rangi we would have had most of them in if it wasnt for a certain angel investor who thought he was smarter than everyone, be great to get them. And having kohacon next door to turkey next year works out really well! 19:38 mtj so.. is the Turkish Koha a modded verision 2.x ? 19:42 pianohacker how on earth are they doing that many bibs without zebra? 19:42 jcamins Tumer had a vastly superior Zebra configuration. 19:43 huginn rangi: The operation succeeded. 19:43 cait hope it will be good for them and maybe we can get some of the zebra goodness...? 19:45 jcamins As long as Brooke is able to get her visa, anyway. 19:45 magnuse isn't paul_p going? 19:46 jcamins She said it hadn't arrived yet. 20:28 huginn Francesca: The current temperature in Wellington, New Zealand is 12.0°C (9:00 AM NZDT on October 14, 2015). Conditions: Clear. Humidity: 62%. Dew Point: 5.0°C. Pressure: 30.12 in 1020 hPa (Steady). 20:57 huginn tcohen1: The operation succeeded. 21:16 rangi you have the reverseproxy stuff in apache eh? 21:17 rangi have you tried it with just the reverse, and without the preserve host?